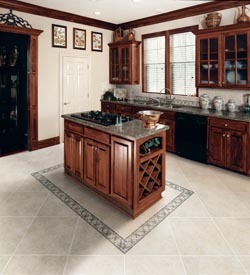 Mazza's Flooring America is your source for gorgeous luxury vinyl flooring in Hammonton, NJ. We have a wide selection from the top manufacturers on the market, making us the only name you need to know when you’re ready to experience the joy of having luxurious flooring under your feet. You are sure to find exactly what you need to match your style. Stop by our showroom today and take a look at our catalog of vinyl flooring. No matter what you have in mind, we can help you find it. Luxury vinyl tile is popular for a number of reasons, chief among them being its fantastic ability to mimic virtually any type of flooring material on the market. Homeowners throughout the area are making the switch to vinyl so they can have the elegant look of hardwood or tile while still getting the durability, longevity, and price-point associated with LVT. Using the latest in embossing technology, LVT can perfectly imitate natural materials, right down to knots in the wood. See for yourself just how incredible modern manufacturing can be by stopping by today. Many people struggle to find the right flooring for rooms such as bathrooms and kitchens. These spaces require resilient flooring that can stand up to spills and splashes, limiting your options as far as styles are concerned. The days of settling on flooring for these rooms are now over. With LVT, you can get the best of both worlds. Your new flooring will not only hold up beautifully to any amount of moisture you throw at it, but it will also look exactly how you want it to. Thanks to its ability to mimic any type of material, you have endless options for designing your kitchen and bathrooms. Luxury vinyl plank flooring is the ideal solution for designing these rooms. We want the new floors you purchase from our team to be absolutely perfect. That is why we offer comprehensive installation services, ensuring that nothing goes wrong with your new floors. We'll be there for you throughout the entire floor-buying process, from helping you pick out the ideal material to ensuring that the finished product looks as beautiful as possible. If you want your floors to look great and last as long as possible, reach out to us for luxury vinyl plank flooring. Contact us for the finest selection of LVT in the area. We are proud to serve Hammonton, Cape May, Vineland, Ocean City, and Atlantic City, New Jersey, and the surrounding areas.